Our twins (and triplets!) make this kids’ consignment sale twice as nice with double the selection! Want to be the first in the know about our future Twice as Nice consignment sales? Over 20,000+ items for infants, toddlers, kids, pre-teens & juniors! Items range from gently loved to new without tags condition, from preemie to junior sizes! Brand name and Designer clothes and shoes at fantastic prices for girls and boys! Newborn necessities: Strollers, car seats, high chairs, swings, changing pads, safety gear, gates, and more! Twin Sets! Are you a mother of multiples and interested in shopping the twin sets? Email sale@ndmotc.org to learn how! $1 admission required for non-NDMOTC members. Volunteers shop the night before the sale, Friday at 8pm. Super Volunteers shop the night before the sale, Friday at 6pm. Board Members (who complete a Friday night volunteer shift) shop Friday at 6:30pm. Can’t volunteer or don’t want to? All NDMOTC members can shop starting one hour before the general public on the morning of the sale, starting at 7:30am Saturday! Still doesn’t work for you or your schedule? You can email sale@ndmotc.org and we will work with you! VIP Fast Pass Shoppers shop Friday, the night before the sale opens, at 7pm. Interested in purchasing a VIP Fast Pass? We only offer 25 Fast Pass spots (not including co-shoppers). They are $25 (non-immediate family co-shoppers are an additional $10). Make sure you add yourself to our emailing list so you hear about our Fast Pass options! Facebook Raffle Winners shop Friday at 6:30pm, so make sure you enter on our Facebook page! Are you the first to know? What time can I shop at the Sale? Non-Members / General Public (who aren't co-shoppers) Saturday from 8:30am - 12:30pm! 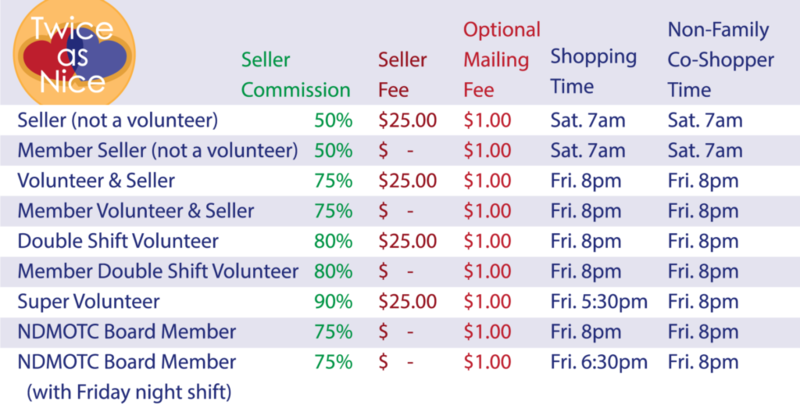 For Volunteer, Seller, and Co-Shopper shopping times, please see the image below! And all you have to do in return is one 4-hour shift (or have a family member or friend do it for you!). For more information, check out our Volunteer Facebook Page (members only: https://www.facebook.com/groups/ndmotctwiceasnice). 'Stork' (aka sitting) spots for expecting moms, childcare for Friday day volunteers, and security dad shifts - oh my! Sick, recovering, out of town, or just plain don't want to? No worries! Still get all the benefits, by having a family member or friend volunteer for you! Sign up for your volunteer shift and then email sale@ndmotc.org with the name of the person who's taking your shift! What is a Pick Up Site Volunteer? A Pick-Up Site Volunteer is the coordinator between their 10 assigned sellers and the Sale Event. You would arrive at the sale at 12:30pm on Saturday for sorting, breakdown and pickup of all items after the sale. Everyone is usually done by 2pm. You keep all unsold items at your home (keeping items secure, clean, and dry) until the seller picks them up. You are NOT allowed to leave items outside unless the Seller has requested you to do so. If by Tuesday, the Sellers in your area have not made arrangements to pick up their unsold items, you may donate all remaining items to the charity of your choice. Anyone serving as a Pick-Up Site Volunteer must have a large sports utility vehicle, truck, or minivan to transport all items. Please do not volunteer if you cannot transport a large quantity of items or equipment. Keep in mind that this job is physically demanding. If you are pregnant or cannot do physical activity, we highly recommend that you register for a different volunteer shift. How do I become a Pick-Up Site Volunteer? *This information will be posted so that the sellers in your area can contact you. If you are selected, you will receive an email confirmation. If you are not selected, you will receive an email and you may be placed on a waiting list. We very rarely have to go to our waiting lists, so you will need to select another volunteer shift on Friday or Saturday for the weekend of the sale. How do I sell my things at the Sale? All sellers must be mothers of twins (or triplets or quads) or must be selling through a friend who is a multiple mom. You do NOT need to be an NDMOTC member to sell, though NDMOTC members do not have to pay a seller fee. (Please see the image below for fees and commissions). Interested in selling at the NDMOTC Twice as Nice Sale? Email sale@ndmotc.org for more info. Seller numbers start with a letter representing the geographical area you live in (see list below). The next three numbers are based on the sale; to check this current sale's numbers, go to the documentation on our Seller/Volunteer Facebook Page: https://www.facebook.com/groups/ndmotctwiceasnice. For example: If this sales numbers are 231-239, and if I live in West Dallas, I could pick G235. Or if it was unavailable, I could try G232. What are the geographical areas available for Pick-Up Site Volunteers? Site Letter A - Richardson Site Letter B - Murphy, Wylie, Sachse Site Letter C - Allen, McKinney Site Letter D - Plano Site Letter E - Far North Dallas, Addison Site Letter F - Lake Highlands Site Letter G - Highland Park, University Park, West Dallas Site Letter H - White Rock Lake, Lakewood, Lockwood, East Dallas Site Letter J - Garland Site Letter K - Rockwall, Rowlett Site Letter L - Carrollton, Farmers Branch Site Letter M - The Colony, Frisco Site Letter N - Coppell, Flower Mound Site Letters V, W, X, and Y - reserved for those people who may wish to pick up their own unsold items Site Letters Z - reserved for Committee and Co-Committee members Note: there intentionally is no site letter with the letter "I". Interested in Selling at the Twice as Nice Sale? Don’t list each item on multiple sale sites, hoping a buyer will see your items. Don’t spend days messaging with random people, deal with no-shows and hagglers! Instead, consign your new to gently loved items at the Twice as Nice Consignment Sale! It’s easy! Simply enter and tag your items at home at your own pace up until the Thursday before the sale. Then, Friday before the sale, drop off all of your items at the Richardson Civic Center. After the sale, you can register to pick up your own items, or pick them up from the Pick Up Site Volunteer who lives in your city at your convenience! You’ll get paid via PayPal or Venmo (or for an extra $1 you can wait for it via snail mail, ha). We would love to have you as a volunteer or seller! All mother’s of multiples, members of NDMOTC or not, can sell in our sale! Still have questions? Just want to talk to someone who’s done it before? Email Chloe Cleveland at sale@ndmotc.org to learn more!